Sending the first couple of introductory messages can be awkward, but some people are super suave when it comes to setting up the conversation. Most of the time though, these openers would never fly in real life. Here are 25 hilariously witty Tinder pickup lines that no one would actually say to a stranger in person. 1. It’s safe to say that you’re not going to find your romantic comedy meet-cute on the wildly popular dating app Tinder. However, that’s not to say that swipes haven’t led to relationships blossoming — even if they only last for a night. When you’ve been playing the swipe game for some time, the “hey, how are you?” can get pretty drab. Realistically, the set up for the traditional conversation makes it easy to hit a dead end unless one of the two parties decides to steer it into the unconventional. This guy decided to switch things up and ask what appliance his potential love interest would be. It’s not the most swoon worthy question, but it certainly gives you a little more insight into one’s personality. 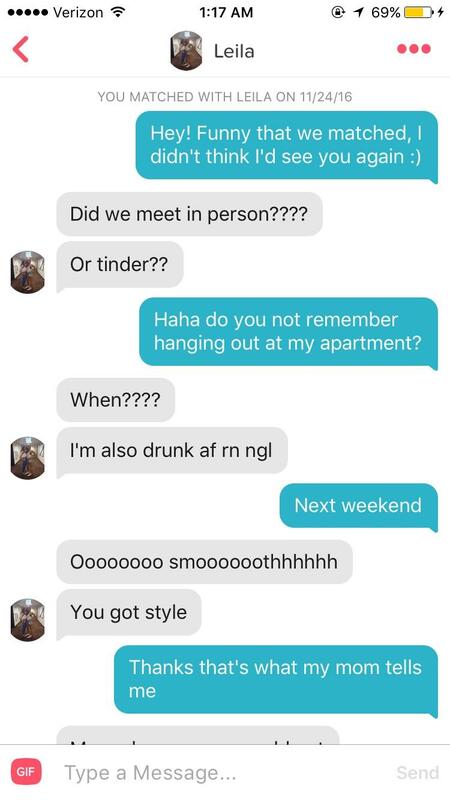 While this guy’s line may have been planted so he could throw in a pickup line with any given response, Kiana managed to beat him at his own game. 2. This guy managed to hook his booze-muddled match by pretending they’ve already met, which seemed to work out for him. It’s a risky and kind of creepy approach to picking someone up, but it’s certainly a way to get the conversation ball rolling and pique someone’s interest. Unfortunately, she probably won’t remember this exchange.